The Trans-Pacific Partnership Agreement (TPPA), which the New Zealand government is keen to sign up to, is the largest trade deal in history, involving 12 countries stretching from Chile to Japan, representing 792 million people and about 40% of the world economy. (It does not include China because it has a hidden American geopolitical agenda to contain China’s growing economic influence). It is not just a supersized trade agreement but a much more comprehensive and powerful one, and has been described as “a trade agreement on steroids.” But the results of previous ‘free trade’ agreements such as GATT, NAFTA, and MAI are unequivocal: They promised the ‘glories of globalization’ and prosperity but the only thing they ‘globalised’ was poverty. They made multi-national corporations obscenely profitable, but destroyed the lives of millions of workers. They did not create jobs, they simply shifted them to countries where wages and costs were lower, and they contributed to mass job losses, lower wages, forced migration, soaring inequality, and escalating environmental degradation. They have been a major cause of rising inequality and the ascendancy of the mega-wealthy 1% who now own most of the world’s economy. Overall, the global result of these trade agreements has been that the rich have gotten richer and more powerful, while everyone else has gotten poorer and more powerless. The big multinational corporations are economically larger than many countries, particularly small countries like our own. 51 of the world’s largest 100 economies are multinational corporations; only 49 are countries. It is not just about wealth, it is also about political power; large corporations have grown more politically powerful at the direct expense of governments, which have declined in power relative to them. In an era of globalisation, multinational companies are gaining more and more political power and public influence. The real ‘promise’ of the TPPA is that it will lead to even higher levels of corporate profits for the 1%, but job losses, lower wages, higher prices, loss of sovereignty, loss of democracy, less internet freedom, and environmental destruction for everyone else – and genocide against indigenous peoples. It will benefit only a few who are already rich, and negatively affect most New Zealanders. John Key claims there are “billions of dollars in economic benefits.” But he is an ideologically driven banker who believes in discredited trickle-down economics. These so-called ‘free-trade’ agreements are classic trickle-down economics which is a form of zombie-economics which experience has proven does not work. 99% of the benefits of these trade agreements have gone to the top 1%. The corporations, banks, and rich investors reap 99% of the benefits and literally make out like bandits, and we – everyone else – get what’s left. In short, the rich get the gold, and we get the shaft. The economy grows but inequality increases because it concentrates at the top and does not ‘trickle down’ or redistribute to the middle and lower classes. An example of this here in New Zealand is that 20 years ago the richest person in New Zealand was the ‘beer baron’ Doug Myers, worth $325 million; today it is Graham Hart worth over $8 billion. The TPPA is a terrible deal which is not mainly about free trade – it is about monopoly and corporate power amounting to a corporate takeover. It primarily deals with establishing a ‘partnership’ for corporate protectionism. Nations that join must conform their laws and rules to the agreement’s strictures, effectively supplanting sovereignty and cancelling our right to be self-governing. It does this by handing foreign corporations the power to overturn New Zealand laws or influence or prevent new laws if their profits are threatened. In this way, the TPPA gives away much of our sovereignty to corporate lawyers and establishes corporate rule over us. 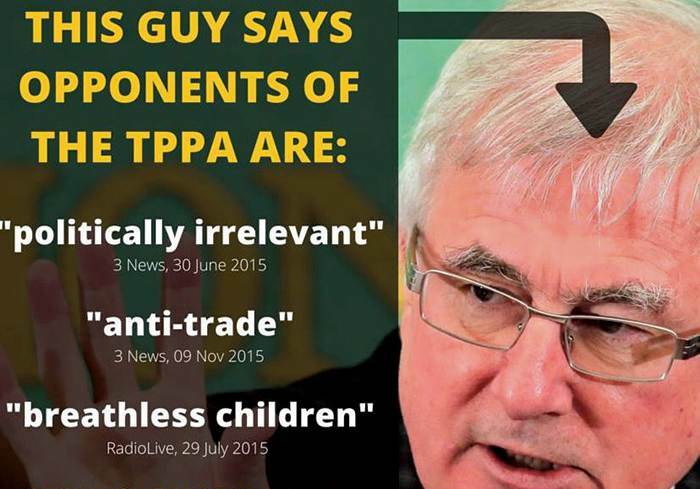 The government, led by Minister of Trade Tim Groser, has responded to growing popular opposition to the TPPA with name-calling, lies, and avoidance of the issues. They never mention the legitimate concerns raised by the ISDS mechanism, apparently believing that corporations will not use this power to sue our government despite the fact that such powers emerging from other trade agreements are already being widely used. They also wrongly claim that critics of the TPPA are opposed to trade, when in fact they are not against trade they are against a bad trade deal. We are in the midst of an epic battle between the people of the world and multinational corporations. Governments and mega-wealthy corporations are merging in a global system in which private corporations have increasing power over your life. This has been described as “a grand rush to neo-Feudalism.” Does anyone except the rich believe corporations need even more wealth and power? Do you? All content is opinion, and the editor(s) do not necessarily share the views expressed by contributors, nor verify the information for accuracy. Perspectives is independent from Ōtaki Mail and we are grateful to them for allowing us to purchase space to share information often lacking in main stream media. We are funded by donations. Opinion Pieces are most welcome for submission to Perspectives. Preference is given to articles approximately 600 words or less. Opinions may include general articles, book reviews, movie reviews, or information about community or individual’s projects. Opinion Pieces do not necessarily need to be a current event or about a recent release. Cartoons, memes and photos are also most welcome. Please contact Editor Amanda Vickers if you would like to support this initiative. A website will be up soon. We would like to thank the Scoop Foundation for supporting this initiative with licensing content to be published from time to time.